…and K’s stocking is coming along. Thought I’d forgotten all about it, didn’t you? Just because I might have been a little distracted by this? Last week, I was at a meeting with someone wearing a beautiful shawl. 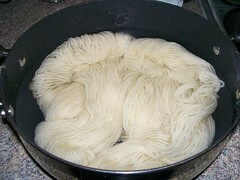 She mentioned that it was made from Wollmeise. And I remembered that I had a barely-begun Wollmeise shawl project sitting in my closet: my Entomology shawl. I pulled it out of the closet and read through the instructions again. I had not quite finished stringing all the beads. The instructions for the shawl give a handy little tip. Instead of counting out each of the 1205 beads, string a bunch on and measure how many beads fit in an inch. Do a little multiplication, and you can simply measure the string of beads for an estimated total. I did the math. 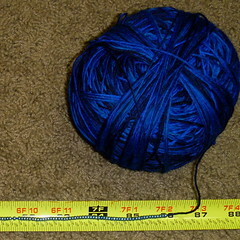 And I realized that, at 14 beads per inch, 1205 beads would measure just over 7 feet. That’s a lot of beads. I strung them all, plus an extra inch or so for insurance, and cast on this evening. 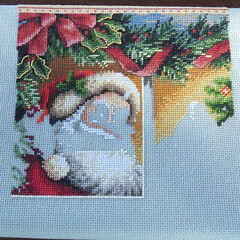 During a couple hours of tv watching, I worked my way through the 20 rows of chart A. And then realized I completely forgot to place the beads that were between stitches – I only did the ones in the yarnovers. My little shawl is back to being a ball of yarn with a whole lot of little tiny beads. 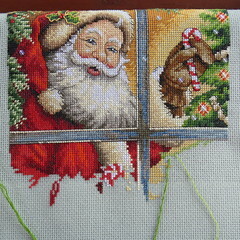 And that cross-stitch stocking is looking at me reproachfully. He’s a little creepy with only part of a face, isn’t he? It’s not that I hadn’t heard of the Sock Yarn Blankie. It kept popping up in podcasts and here and there in the Ravelry Forums. As cool as Shelly’s Blankie looked, I just didn’t have any desire to turn my scraps into a real, honest-to-goodness project. And then Stacy started talking about it, too. 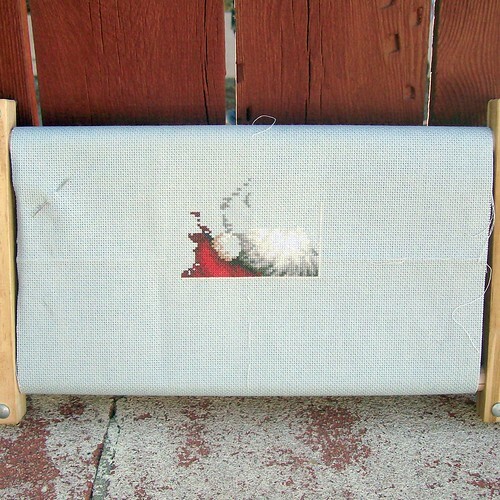 She mentioned another lovely blanket, and then I stumbled on Elizabeth’s gorgeous project (also, she has the best blog name ever). 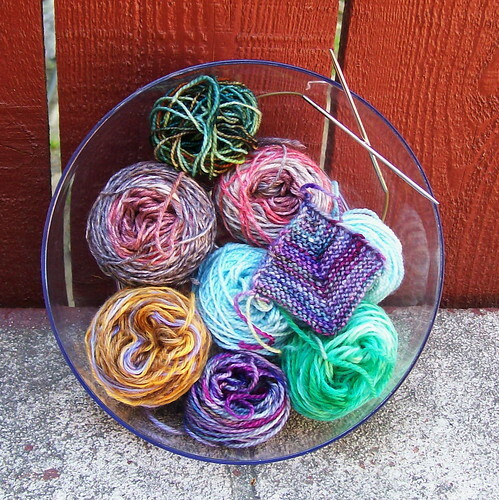 I have been keeping sock yarn remnants neatly balled up in a drawer of my card catalog cabinet, like they were just waiting for this project. 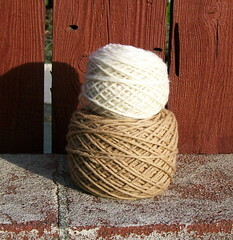 I swapped several remnants with Stacy, joined the BlankieMania group over Ravelry, and found a mini-skein swap to join. 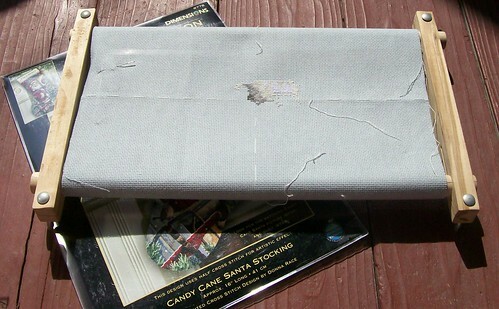 I shipped off an envelope full of yarn. 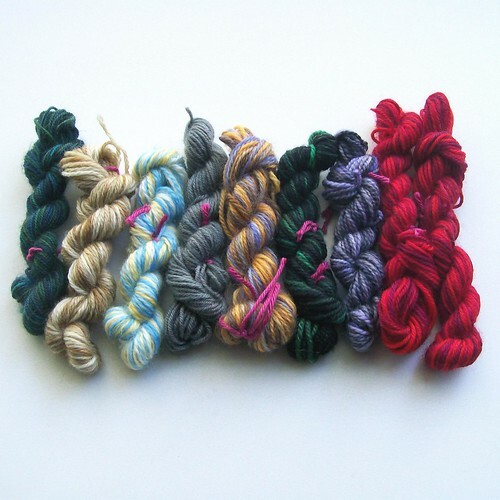 I can hardly wait for my new mini-skeins to come in. There hasn’t been much knitting going on around here lately. I started the Couch to 5K program a few weeks back, which means I get up quite early to go running, which means I (usually) go to bed quite early, which means what used to be my evening knitting time now gets used up by things like checking my email while watching How I Met Your Mother. And you thought it was slow going knitting a lace shawl. 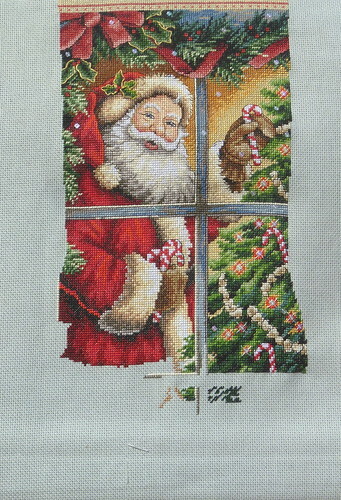 This is the third of three cross-stitch stockings for our family. 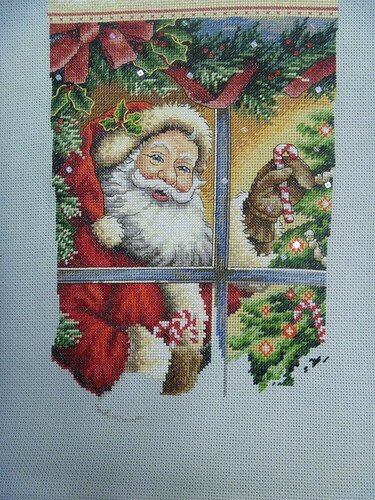 It was supposed to be done for last Christmas, but since I took more than a year doing the second stocking, that didn’t happen. 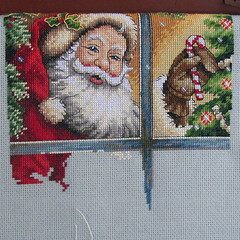 I am determined to finish it for this Christmas. And then, maybe I’ll knit myself a lace shawl. K came into the kitchen early this morning to find me with a couple of pots heating up on the stove. “What are you cooking?” she asked. I think she was a little disappointed. Especially after discovering that I managed to avoid boiling the pot over again, so I was unlikely to scrub the stove again. I decided that I didn’t like the colors of Cascade 220 I had on hand for the jackalope’s ears and paw pads. Also, I really wanted to try some Kool-Aid dyeing. And, I’ve decided that I want to knit up a baby jackalope, too, and I needed more brown yarn. 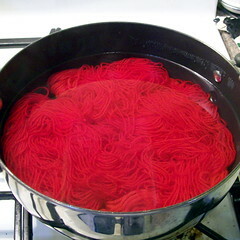 I’m fascinated by the way the water turns clear as the yarn soaks up the dye in the Kool-Aid pot. 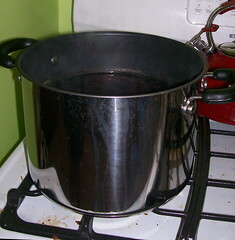 Tea dyeing leaves you a (big, strong, yarny) pot of tea after removing the yarn. 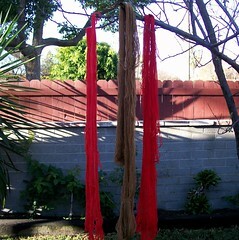 My yarn hanks are drying in the yard at the moment. I’ve finished the body and legs of the jackalope, so I need to get going on those paw pads. 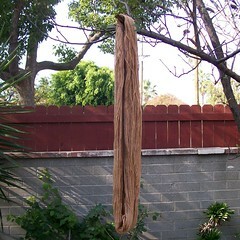 This batch of tea dyeing gave me a much darker yarn, which is kind of neat. The red yarn is the result of 4 packages of strawberry Kool-Aid mix. I would have liked it lighter – I probably should have tried to get some of the Pink Lemonade flavor. Maybe next time. For the last couple of months, I’ve been engaging in a little experiment. 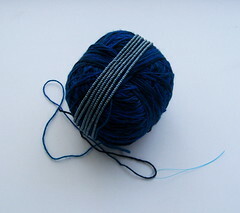 At the end of August, I challenged myself to avoid purchasing any yarn until my birthday (at the end of January). 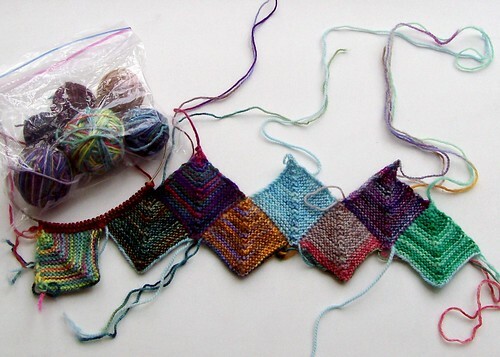 When I decided to go to Stitches West, I moved the goal posts to the first day of Stitches. I made two exceptions to the No Buying Yarn rule: (1) the Loopy Ewe Sock Club packages, which bill for each shipment rather than up front, and which I committed to back in the Spring, and (2) a possible extension of the Tempted @ 3AM club, which did take an upfront payment, and I can’t tell you how nifty it is to get yarn in the mail that you paid for so long ago it’s like the yarn is coming for free. Other than that, I’ve been knitting out of my stash. Meanwhile, people have been confessing their falls off the Cold Sheep Wagon. So, I wanted to share a Cold Sheep Success Story. It started out with me wanting to knit up a Jackalope for K. It was supposed to be a surprise, but that’s another tale. 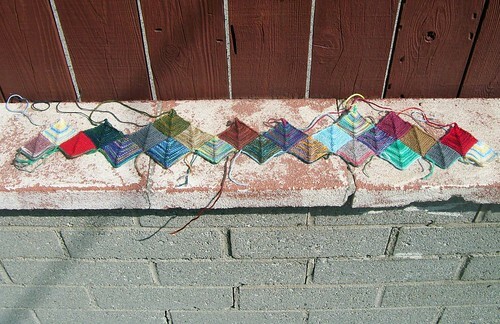 The stumbling block was a lack of rabbit-colored yarn. I have several single skeins of Cascade 220 in red, orange, green, and blue, but no brown or gray. But I do have something: several skeins of white (which I didn’t want to use for the body, because I want to use white for the horns; also, a jackalope is a desert animal, not a snow animal!) and a whole lot of tea. 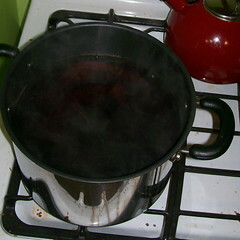 That’s an 8-quart pot (not quite full) and 12 bags of Tetley’s British Blend. It came out a very nice desert rabbit brown, I think. And I didn’t even need a separate set of pots. 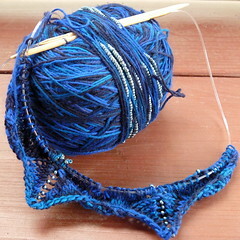 I’ve been alternating working on the jackalope with working on my third second Zig-Zag Diamonds sock. Progress on the sock is slow, but I’ve turned the heel and picked up the pattern for the foot in the right place this time. At this point, I really just want to be done with it.